Will AT&T make satellite internet the new dial-up? Rural broadband—often ignored due to capital expense—is set to have affordable fiber optic-like speeds available to anyone with power through AT&T’s new patented AirGig® technology. AT&T expects to roll out this new millimeter wave technology by 2021 and, as a result, InMyArea (IMA) estimates that the satellite internet industry could lose over 30% of its market share by 2026. AT&T’s low cost AirGig® technology transmits broadband internet along electrical power lines as opposed to traditional cables. This updated transit is augmented by egg-shaped antennas sending data wirelessly through the millimeter wave (mmWave) spectrum at incredibly high speeds and long distances around power lines. Essentially, data travels along power lines to a wireless transmitter installed on a utility pole. Customers receive the data via a wireless receiver placed in/on their home. 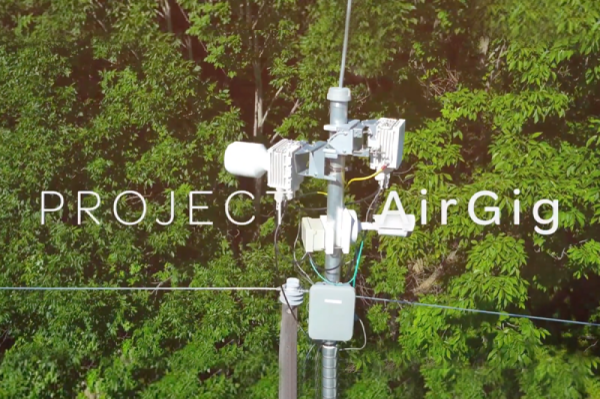 Roger Entner, CEO of Recon Analytics, claims AirGig®’s signal should reach anyone within five miles of a utility pole, meaning anyone on a power grid should have access to AT&T’s AirGig® internet. The first trial of AirGig®, operated in Georgia, gave participating residents access to speeds nearly 600% faster than the baseline speeds satellite internet providers can offer. AT&T estimates that commercial deployment will increase these speeds to well over a gigabit per second (1000 Mbps+). While the actual deployment date is still unknown, AT&T predicts the rollout will begin early 2021, if not sooner. To fairly compare AirGig® to satellite internet, IMA used the speeds AT&T claimed the Georgia residents received in their trial, roughly 100 Mbps,. At 100 Mbps, potential rural customers can easily connect more than 10 devices that simultaneously stream 4K video, play games online, and download large files without noticing a lag in their service. While HughesNet and Viasat offer speeds suitable for streaming and gaming, each providers’ high latency and narrow bandwidth make their speeds seem slower than it should be. The difference in latency between Viasat (633 milliseconds) and AT&T’s estimation for AirGig® (4 milliseconds) is more than 150 times faster. For now, there is no telling how much AirGig® may cost per month for customers, but IMA believes it will be competitive with the current marketplace. As a basis, IMA used the price its competitor Verizon is offering for a similar 5G broadband service: $70 per month. At that price, AT&T would force satellite ISPs to lower their prices, find a new market, or upgrade their technology. To get speeds and service close to what AirGig® will offer, HughesNet and Viasat customers currently pay between $100 and $200 per month. The real loss would be in their subscriber counts. Even if satellite internet prices were lowered, their primary consumer market are those without wireline internet access. AirGig® could take over that market since it would offer a faster and more reliable connection. Once AirGig® rolls out, satellite customers will have four choices: stay with their current provider, switch to a competitor, use mobile broadband only, or switch to AirGig®. While that should mean there is an equal chance for each service, AirGig® overall will be superior to satellite and mobile broadband in most of the major categories (speed, data cap, contract length, price, and customer satisfaction). Considering the importance of each category, IMA finds there is 33 percent chance customers will choose AirGig® over HughesNet, Viasat, and mobile broadband. To predict the number of subscribers in upcoming years, IMA looked at the trend in HughesNet’s and Viasat’s subscriber count. IMA used the rate at which HughesNet and Viasat gained/lost subscribers to calculate how many subscribers each provider would have by 2020. IMA estimates AirGig® will gain nationwide coverage at a similar rate to LTE due to their similarities. Within a year of its debut, AT&T provided LTE coverage to 54 percent of Americans and reached 98 percent by its fifth year. If customers were to switch to AirGig® at the same rates in which LTE rolled out, taking into account the probability rate at which customers would choose AirGig®, IMA predicts both HughesNet and Viasat will have lost 32.6 percent of their subscribers by 2026. Updating the maximum download speed is necessary for satellite providers, but it won’t solve the issues customers experience due to its limitations. Like satellite, AirGig® will be subject to line of sight problems and may slow down depending on the weather; however, it will be the better option for rural customers and may be the solution to finally getting rural America connected. In response to the advancements in internet technology, both HughesNet and Viasat plan to launch new satellites. A Hughes representative commented the new satellite, EchoStar XXIV, is planned for launched early 2021 and should increase customer speeds to 100 Mbps. Viasat’s last attempt at increasing customer speeds to 100 Mbps ended up costing them almost 13 percent of their subscribers. IMA reached out to Viasat for details on Viasat-3, the newest constellation of satellites it plans to launch, but nothing had been received by publication time. This story will be updated when a response is received. Annual Report 2018. Viasat. http://investors.viasat.com/static-files/4ad76635-873d-4069-be76-bf25da0f1f26. Annual Report Year Ended December 31, 2017. EchoStar. http://ir.echostar.com/static-files/8af69b39-bded-4d2e-90df-2674fafc1947. Entner, Roger. Personal Interview. 25 September 2018. “Key features and requirements of 5G/IMT-2020 networks”. ITU Arab Forum on Emerging Technologies Algiers – Algeria, 14-15 February 2018, https://www.itu.int/en/ITU-D/Regional-Presence/ArabStates/Documents/events/2018/RDF/Workshop%20Presentations/Session1/5G-%20IMT2020-presentation-Marco-Carugi-final-reduced.pdf. “Project AirGig Gets Closer to Initial Commercial Deployment”. AT&T, 10 September 2018, https://about.att.com/story/2018/airgig.html. Shankland, Stephen. “AT&T AirGig could mean 100-megabit rural broadband in 2021”. CNET, 10 September 2018, https://www.cnet.com/news/at-t-airgig-could-mean-100-megabit-rural-broadband-in-2021/.